This morning I woke following a very short night, my body always wakes me at 5am, and I love that, but not so great when you get to bed at 1.30am. So, lying under my duvet, I was drawing my mind to focus on what my thoughts were for today. Cuddled under my duvet, as I am now, my white, thick, fluffy duvet came to mind. 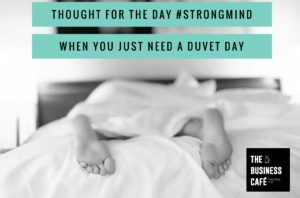 So today’s Thought for the Day is the importance of a #duvetday. I am not having one today however, and I don’t need one. But when I do need one, I embrace it, perhaps 3 times a year, three very important days when I allow myself to hide under a duvet, reset, indulge in my emotions and I always emerge, like a caterpillar from a chrysalis, re energised and ready for the mountain climb of business, I have healed from what ever reason my duvet day struck me. Just the need to hide and close the world off. In reality, how many days off do we take as a business owner, perhaps a fixed summer holiday and time around Christmas, the Easter Bank Holiday, but rarely a sick day, rarely a day to play. Certainly not the 20 days holiday we would get as an employee or the allowance of a sick day due to a cold! When my children were little, I was acutely aware that they could only have a day off school if they felt ill. This made me wonder if their little bodies would manifest a sore throat or a tummy ache just because they needed a rest. I told them, that if ever you need a TV day, a rest from school and people, just be honest with me and I will give you it. It worked magic. That empowerment meant they were rarely unwell and in fact, hardly ever asked for it, but they knew they could, and they wouldn’t be judged for it, they didn’t need to feel guilty or deceive themselves into resting. Life is full on, information, expectations, technology, social media, the speed and need to keep up; sometimes this results in an overwhelmed feeling, if not listened to, this can result in stress, anxiety and even more serious, the danger of depression. I really think we need to love ourselves as business owners, care for our well being, listen to our needs and react, not supress. Having a duvet day is positive, time to rebalance, reset, respect ourselves and respect that the roller coaster of business ownership means we can step off it occasionally and watch the ride, but not be on it. I like the fact that when an athlete that wants to take milli-second off their time will use rest just as much as train, they know that it is at rest that their bodies build the stamina and the tenacity to push harder. Perhaps you know what I mean, perhaps your #duvetday is a big walk, a moment at the sea, a day in front of the TV, what ever it is, embrace it, love it and don’t waste it on guilt. I truly believe that at rest we grow, this is all part of our success. Would love your thought on this, whether you struggled to embrace this, now, in the past or hope to allow more in the future.